You’re going to need a coat for this chilly new season of Fortnite Battle Royale. An avalanche of map changes has come along with the start of Fortnite Season 7, including confirmation of the new Iceberg Biome, as well as new named locations Frosty Flights, Polar Peak, and Happy Hamlet. The Iceberg Biome was the big thing that we knew about before release, and featured heavily in teases and leaks. The snow seems to have taken over a large part of the western side of the map, covering it in slippery ice as well. You’ll slide across the ice when you run across it, which will add an extra element to gunfights in those areas. As for the new named locations, some are replacing current named locations, whereas other are in addition to the places we know and love. 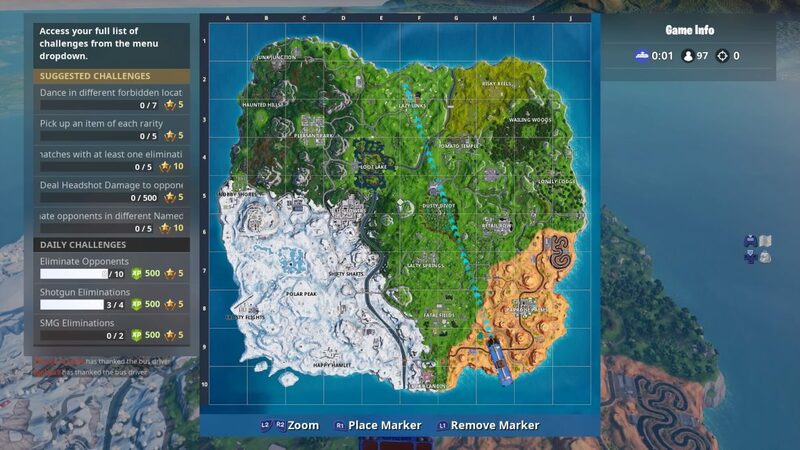 From the image above, you can see Frosty Flights and Polar Peak are on the western edge of the Fortnite map, below Snobby Shore and the Viking Village. It also looks like there’s a new ice lake south of the Viking Village and north of Polar Peak. Some of Tilted Towers and all of Shifty Shafts are now covered in snow. While Happy Hamlet is on the southern tip of the island, and replaces Flush Factory to the west of Lucky Landing. We’ll miss you giant toilet. Map changes aren’t the only thing coming to Fortnite in the new patch. There are tons of leaked skins from Season 7, as well as the blockbuster new Fortnite Creative mode, which lets you make you own games from Fortnite assets. It’s much more flexible than the Playground was, and we’re sure the community are going to come up with come amazing creations.